Who says professional systems integrators are not hobbyists as well? Many visitors to our stand wanted to throw their business card into the fishbowl to win one of the six BASpi's we were giving out at the show. The BASpi is the "top hat" to a Raspberry Pi but with the drawing we gave away both the Raspberry Pi and BASpi. Although there are several micro-PCs on the market, the extremely powerful Raspberry Pi is probably the most popular. The BASpi is no toy. When married with a Raspberry Pi, it provides six universal inputs (binary, analog, pulse, temperature and resistance) plus six relay outputs. It includes a Sedona Virtual Machine (SVM) so with our Sedona Applications Editor (SAE) it can be freely programmed using Sedona's drag-and-drop methodology of assembling components onto a wire sheet to create applications. SAE is part of our free BAScontrol Toolset which also includes BASbackup – BAScontrol Project Utility and BASemulator – BAScontrol emulation on a PC. These three tools are compatible with the BASpi. 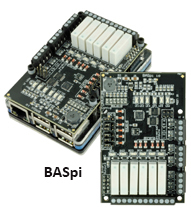 Besides being an open Sedona controller, the BASpi is also BACnet/IP compliant. Configuration of BACnet points is via web pages. Time-of-day is handled with a NTP server. With both Wi-Fi and Ethernet ports on the Raspberry Pi, it is possible to be attached to a BACnet head-end on the Ethernet port while programming the controller over Wi-Fi. So, what applications is the BASpi suited for? It is up to the systems integrators to decide. Several ideas we heard were IoT related such as monitoring chiller operation not for the benefit of the building owner but for the manufacturer to understand how the equipment was performing. Other ideas involve home automation. Some ideas were hobbyist in nature – I want to learn more about micro-PCs or I want to learn to program HVAC applications. The BASpi is also a great trainer. The BASpi will be available March 1, 2018. Learn more on the BASpi product page.